This textbook is an introduction to the tourism and hospitality industry in British Columbia, and is written with a first year college and university audience in mind. It is a collaborative work with input from educators, industry leaders, employers, and past graduates of BC’s tourism and hospitality management programs. All chapters have been reviewed by experts in the field. Each chapter is organized thematically moving from a global, then national, and finally provincial context. Chapters contain "Spotlight On" boxes that highlight an organization, business, or other key component and "Take a Closer Look" features that encourage further reading on particular subjects. Key terms, exercises and case studies can be found at the end of each chapter. This montage includes: Vancouver Island University (https://www.flickr.com/photos/83374808@N05/14169303681/); BC Ferries from Nanaimo (https://www.flickr.com/photos/83374808@N05/13986039017/); Capilano Universitys Team (https://www.flickr.com/photos/83374808@N05/10594703525/), all by LinkBC (https://www.flickr.com/photos/83374808@N05/) and all used under a CC-BY 2.0 license (https://creativecommons.org/licenses/by/2.0/). Introduction to Tourism and Hospitality in BC by Morgan Westcott, LinkBC, Geoffrey Bird, Royal Roads University, Peter Briscoe, Ray Freeman, Royal Roads University, Kelly Glazer, Keith Henry, Terry Hood, Heather Knowles, Micki McCartney, Vancouver Island University, Donna Owens, George Brown College, Lynda Robinson, Vancouver Island University, Eugene Thomlinson, Royal Roads University, Griff Tripp, Don Webster, Capilano University, Rebecca Wilson-Mah, Royal Roads University is licensed under a Creative Commons Attribution 4.0 International License, except where otherwise noted. 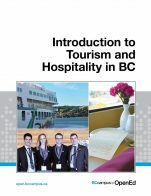 The textbook provides a comprehensive coverage of tourism and hospitality in BC and is ideal for a first year class. The content sets the industry in BC within a global, national and provincial context. Overall, the textbook is excellent with a clear presentation of topics in a logical manner with good flow. The examples and illustrations are frequent, and the key terms at the end of each chapter are helpful. There is a good summary of what is to be achieved at the beginning of each chapter, and another glossary of key terms at the end of the textbook. There are no solutions to end of chapter exercises for the student in the textbook itself. The content is accurate and well presented. There are no obvious errors and text is unbiased. There are many up to date illustrations and examples, and the overall tone of the textbook feels very current. Some of the statistics are from 2014. Good coverage on topics such as global trends, which is also up to date. There will be some maintenance necessary to keep the figures current. This text is written in an easy and enjoyable read manner is ideal as an introduction to the subject. The language is clear, there are regular review tables to revisit terms and concepts, and the glossary at the end of each chapter is a quick useful reference. There is also an alphabetical glossary at the end covering all chapters. In addition, there are links to the appropriate chapter when a subject is revisited. There is a good use of local examples such as well-known tourist sites or hotels to illustrate the concepts. There is also good use of photographs in each chapter. There is good consistency throughout. There did not appear to be any new concepts introduced later in the text that had not been explained earlier. Chapters can be read on a stand-alone basis. Selected chapters could also be put together to provide a custom approach to the subject. The textbook has excellent flow, and it is obviously designed to be read from beginning to end. Each chapter, however, stands on its own and faculty could change the content order of each chapter. The overall flow of the chapters is logical, although chapters could easily be read out of order if preferred. Within each chapter, the sections and subsections are clear and consistent and tend to flow well. The text is easy to read in terms of navigation. Charts and tables are clear and easy to follow. The use of colours and highlighting is helpful. The “spotlight” text boxes allow the reader to link to a relevant website for further information – worked well. There were no obvious grammatical or spelling errors. This textbook is designed for students of tourism and hospitality in BC and it works well. Obviously there is limited scope for its adoption outside of the province. Chapter 12, on Aboriginal Tourism is particularly helpful. The text is not al all culturally insensitive. The final chapter on globalization and trends gives a broad brush view of global issues. This textbook is ideal as an introduction to BC tourism and hospitality. It is up to date, covers all the main issues and is presented in as easy to follow format. This text covers each topic quite well. My class and I have really enjoyed the Canadian and BC focus in each chapter. It is also very up-to-date and includes excellent Internet links and activities. The chapter glossaries are also very helpful. The photographs are beautiful, but perhaps other graphics could be used such as pie charts, flow charts, and timelines to help with comprehension of concepts. The material is nicely balanced and covers various topics and issues in tourism today. As is to be expected, a few websites have changed slightly, or the links don't quite go to intended page. I have found some PowerPoint errors in Chapter 4. Slide 14 has the box at the top "Click to add title"; Slide 17 has a heading but no notes. p.138 in the Spotlight On BCLC - "informatioon, visit http:"
Chapter 6 PowerPoint slide 6 - "The broad nature of festivals has lead to the..."
I think the text is very good in this aspect. A lot of data and information, weblinks, and topics are very current. Even with something as new as Uber, there is mention of it and some comment on its potential (both positive and negative). This text has been perfect for my students. The language is clear and simple, yet the topics are often deep and serious. The content has not been dumbed down. Agency acronyms (and there are so many!) are clearly explained rather than assuming readers know them. With other textbooks, even I have had to look up these types of abbreviations because they aren't explained! The key terms for each chapter have been really helpful too. I have seen no problems with consistency. Each chapter is set up with the objectives to start, topics in logical sequence, and then the glossary and questions. Information given progresses naturally from the basic overview to more in-depth details. Different topics within each chapter are clearly divided. I appreciate the headings for ease of reference and information-gathering. However, on some pages there are 3 or 4 boxes for Spotlight On, or other website links. This makes the page a little chopped up and the reading s can lose their flow. The links and topics are great and I've used so many of them. I know that if they were all at the bottom of the page they might get 'lost'. Perhaps limit them to a maximum of 2 per page, or arrange text boxes at the side of the page. The chapter topics are in a logical order. One topic flows to the next naturally. I do think that Event Planning could be a separate section/chapter, rather than within the Attractions chapter. Event Planning is a big sector of Tourism/Hospitality and it could be developed further into its own chapter. I have mentioned some issues in the Accuracy section of this survey. I am surprised that the PowerPoint slides are not 'locked'. I could click on titles, images, and text and move things around as well as potentially change things. I have mentioned some errors in the Accuracy section of this survey. Otherwise, I didn't notice any grammatical errors. The text is excellent in this area. Many points of history are discussed. Many groups and peoples are mentioned. Perhaps a section on Vancouver's Pride Week Parade could be added. I've really enjoyed my first run through with this text. It was my first experience with an open text, and it was a great, easy-to-use resource. My students and I really liked the Canadian and BC content. It is so hard to find. It's tiring always reading/teaching about Disneyworld, the Grand Canyon, and Hawaii! As we learned about the concepts and ideas of tourism, they were connected to places and activities right in our area. It made the concepts that much more tangible. I also think it opened my students eyes up to a lot of places they may not have thought about before. As I mentioned before, the website links are also really excellent. They are not just listed as references, but are highlighted and described briefly as a further resource and example of the ideas and concepts studied. I used many in class, as group work, and as homework so students could apply what was learned to real companies and cases. The text covers all areas and ideas of the subject. However, not appropriately. It is far to basic of an overview for university students. A more in-depth analysis is required. Yes it is accurate, error free and unbiased. However, the examples are starting to become out of date. An updated version is required. Updates would be relatively easy, However, the book is almost out of date. I would use the text for one more year, but would not use in 2019 without updates. In my option the text is too simplified. Students should be exposed to a high level of writing and a more in-depth analysis and terms should be used. Yes, but each section is to short, limited or summary. In many cases there are only one or two sentences provided in each section. Again, more content is required to bolster or support what is there. Nothing insensitive or offensive, However, limited content that discusses inclusion. As an example, there should be a section on Truth and Reconciliation. I have yes, but not as a stand alone text. In it's current format it is only appropriate to add BC context. I would like to use it as a stand along text. However, it does not provide enough detail for that purpose at this point.